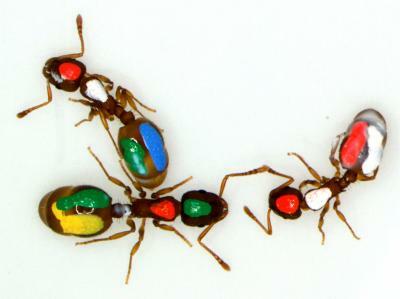 To recognize each individual ant, they were given a unique color code. Be it through the Internet, Facebook, the local grapevine or the spread of disease, interaction networks influence nearly every part of our lives. Scientists previously assumed that interaction networks without central control, known as self-directed networks, have universal properties that make them efficient at spreading information. Just think of the local grapevine: Let something slip, and it seems like no time at all before nearly everyone knows. By observing interactions in ant colonies, University of Arizona researcher Anna Dornhaus and doctoral candidate Benjamin Blonder have uncovered new evidence that challenges the assumption that all interaction networks have the same properties that maximize their efficiency. The National Science Foundation-funded study was published in the Public Library of Science on May 20. The researchers chose to use ant colonies as models for self-directed networks because they are comprised of many individual components – the ants – with no apparent central organization and yet are able to function as a colony. Dornhaus and Blonder studied colonies of Temnothorax rugatulus, an ant species that is common in southern Arizona. Which raises an interesting question: How does one collect an ant colony? The queen, the mother ultimatum among ants, is the only member of the colony that reproduces. Without her, there would be no new ant workers and the colony would die. 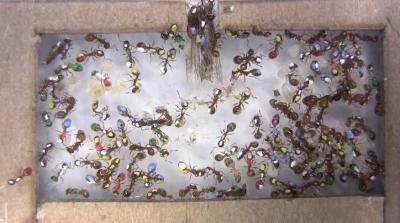 A view from above the ant colony. Back in the lab, the ants were placed in artificial nests. “The nice thing about this species is that because they like to live in rock crevices, they’re also completely happy to live between glass slides. All we have to do is take two large glass slides, put a cardboard spacer in between them and the ants happily walk into that very nice thin space and live out their lives in this artificial nest,” said Blonder. Having secured and relocated several ant colonies, the researchers tackled their second challenge: How to tell two ants apart. The researchers filmed the ants with high-definition video and recorded roughly 9,000 interactions between 300 to 400 individual ants. “We watched every single video repeatedly to make sure we didn’t miss any interactions and correctly identified every ant,” said Blonder. While the ants do have limited vision, it’s thought that most of their sensory input comes through direct chemosensory touch. Contrary to predictions that ant networks would spread information efficiently in the same way as other self-directed networks, the researchers found that the ants actually are inefficient at spreading information. One important factor was noticed: "We could imagine that if the yellow ant passed food on to the red ant which could later give it to the blue ant. However, the blue ant has no option of giving anything to the yellow ant because that would require moving backwards in time." The finding challenges the notion of six degrees of separation, the idea that all individuals in a network are related by six other individuals. For example, I know someone who knows someone who knows someone and so on, and by the sixth person or less I am connected to every person in the world. This would represent a very efficient network, where it only takes six interactions for information to spread to all of the components. Ant interaction networks apparently function quite differently, indicating that other networks also might not be as efficient as previously thought. One possible explanation is a concept most of us already are familiar with: “If you spend too much time interacting, then you’re not actually getting anything done,” said Blonder. 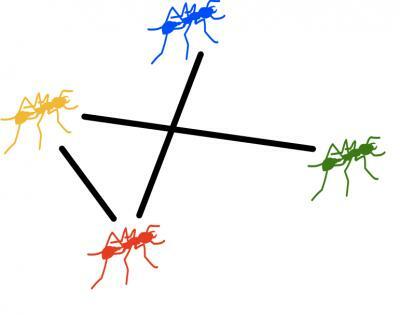 Another possibility is that individual ants are responsible for only their region and only need to communicate with other ants in that region. The research also illustrates the importance of knowing when interactions occur. If two individuals interact and later one of them interacts with a third, then information from the first interaction could be passed to the third individual, but the third individual could not relay information back to the first. “That’s the ordering of events perspective that we’re bringing to this study and we’re hoping is going to catch on with other network studies. We think this is a real opportunity,” said Blonder. Understanding how interaction networks function could have applications from allowing us to build self-directed networks to perform specific functions, such as unmanned drones to explore other planets, to preventing the spread of disease. Doctoral candidate Tuan Cao and undergraduate students Milan Curry, Han Jing, Kayla Lauger and Daniel Wolf assisted with this study.